Utilize existing space. Turning part of your basement into a bedroom is a great way to get the most from your home. It happens all the time. A family gains an extra member or two (infants, aging relatives, or college graduates who can't yet afford to live on their own) and suddenly the house isn't big enough. So the homeowners are forced into a difficult situation. A bedroom in the basement is the perfect way to increase the amount of living space in your home without spending a fortune. Finishing your basement to create an extra bedroom allows you to utilize space you already own and typically costs about half as much as building a home addition. A basement-to-bedroom conversion won't steal any space from your yard, either. If you are interested in a basement to bedroom conversion in Geneva, Ontario, Newark and nearby, call us today for a free estimate! Durable, waterproof, and mold resistant: our wall panels are beautiful and easy to clean. The look of hardwood but the benefits of vinyl: waterproof, won't warp or crack and mold resistant. There are plenty of building and remodeling contractors who will take on a basement bedroom project. It is in your best interest to choose a contractor who has the proper experience. Here at Marshall Exteriors, we are basement finishing specialists dedicated to customer satisfaction and quality, long-lasting work. Our staff has the training, tools and materials needed to execute your basement bedroom project from start to finish, even if the basement needs waterproofing and dehumidification before finish work can begin. Provide Safe Egress. A larger EverLast™ Basement Window, along with a SunHouse™ Window Well will meet code requirements, is vinyl constructed with insulated glass and is maintenance-free. In most areas, local building codes require that any bedroom must have at least one egress window that's large enough to enable the room occupant to escape in the event of a fire. This requirement will also apply in a basement bedroom, so one of the first things your contractor will do is to install a code-compliant egress window. The installation is usually done by enlarging an existing basement window opening with a special concrete saw. In addition to installing a new larger window, your contractor will also install a larger window well outside the house – one that includes steps to facilitate an easy exit. Precast window wells made from reinforced plastic are preferable to metal or site-made window wells. We utilize the best in basement finishing products when it comes to your new basement bedroom! Installing a large window in the basement can bring in natural light and open up the space. The basement wall panels should be insulated with our rigid foam insulation rather than fiberglass batts, which will end up absorbing moisture whereas rigid foam won't. We also use metal studs as opposed to wood studs for the same moisture-resistant factor. Lastly, all the flooring options we have are moisture and mold resistant, and also extremely durable and easy to clean. By taking advantage of our complete basement finishing system, your bedroom will remain mold and moisture free while providing you with all of the benefits of an upstairs bedroom! This is just one basement design idea recommended for finishing your basement. 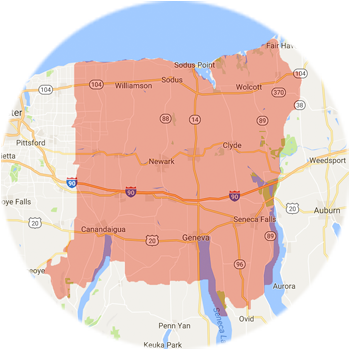 If you wish to have your basement in Fairport, Canandaigua, Geneva, Newark turned into a bedroom or other type of living space, contact us today for a free estimate!